The Atlantic Conveyor was a twelve year old merchant container and vehicle transporter. Requisitioned on 14 April 1982, she was hurriedly refitted at Devonport Dockyard for service with the South Atlantic task force. She sailed from Plymouth on 25 April after undergoing trials, and was carrying 5 Chinook and 6 Wessex Helicopters. Merchant vessels taken up by trade during the Falklands War present an interesting scenario. Although most of their civilian crew stayed onboard and came under the naval discipline act, vessels also had a Naval party of officers and ratings onboard. Obviously, a merchant vessels master will know how to sail the ship better than a naval captain might, but would not necessarily know as much about naval warfare. Hence evidence suggests that the relationship between a ships master and senior naval officer, and indeed her civilian and naval crew, could be critical. The Atlantic Conveyor sailed with 31 merchant Seamen onboard, but 126 military personnel. Of these 36 officers and men formed the ships naval party, the rest were working on the aircraft carried. She arrived at Ascension on 5 May, where she embarked 8 Sea Harriers as reinforcement for the Squadrons already in the South Atlantic, and 6 RAF Harrier GR3. Along with the amphibious group she left Ascension and arrived in the TEZ on 19 May, carrying a total of 25 aircraft. While entering the TEZ one Harrier was actually kept on deck alert, armed with Sidewinder missiles. The missiles penetrated her main cargo deck, and a fireball spread through the ship. As a merchant ship she was not equipped with the kind of damage control that naval warships are, such as bulkheads or sealable sections. Fires spread through her vast, cavernous hold. Firefighting was therefore impossible, and she was abandoned in an orderly manner thirty minutes after being hit – even though cluster bombs were beginning to be ignited by the fires. After burning for another day, she sank whilst under tow on 28 May. Only one of her Chinook helicopters had left – and that only for a test flight. One of the sad statistics about the loss of the Atlantic Conveyor is that of the 12 men who lost their lives, 9 of them had actually managed to escape the ship but died whilst awaiting rescue in the water. Among them was the ships civilian Master, Captain Ian North. North had made it into the sea, but slipped between the waves before boarding a lifeboat. The Senior Naval Officer survived but was deeply moved by the loss of his friend. That 139 of her crew of 149 – 92% – were rescued is testament to the great efforts made by ships and helicopters in the area. One of the helicopters assisting in the rescue was reportedly co-piloted by Prince Andrew. The loss of the Atlantic Conveyors considerable troop-carrying helicopters meant that the land forces would, in the main, have to tab or yomp across East Falkland towards Stanley. This no doubt made executing the war a much harder porposition, than if six Chinooks had been available to lift the Paras, Marines, Guardsmen and Gurkhas right from Stanley to the Mountains. The Argentines might have prefered to have sunk one of the Aircraft Carriers, but sinking the Atlantic Conveyor was a remarkable piece of luck which probably prolonged the war for days if not weeks. The Board of Inquiry into the Atlantic Conveyor found no fault with anyone involved in the loss of the ship, only raising minor points that could not possibly have been foreseen, especially given the speed with which merchant vessels had been co-opted into the war effort. It had been nigh-impossible, in the time available, to give much thought to the loading of explosive cargoes, as would have been the case in peacetime. Obviously she didn’t have the same kind of Magazine arrangements that a military ship might have. It’s an interesting thought, that with a lack of platforms for flying helicopters, and an uncertain world, might it be possible to use ships such as the Atlantic Conveyor in an emergency once again? Her use was very similar to some of the Merchant Navy ships in the Second World War that were fitted to operate a small number of aircraft. Of course, the Harriers were ideal for this as vertical take off aircraft. And do we have enough spare naval personnel nowadays to provide naval party’s in a hurry? Being able to fit merchant vessels with Chaff in an emergency would also seem to be a lesson learn from the loss of the Atlantic Conveyor. 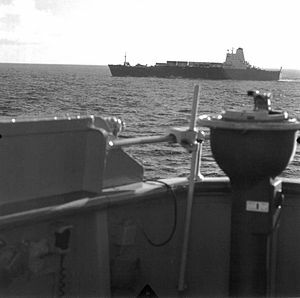 Is there a crew list of the Merchant navy seaman who served on the Atlantic Conveyor during the Falklands War available to review? activity to customers. The film was, consequently, the third-best grossing film of 1994. Participants make on the edge of the share. to his brother. So, what does Twitter claim about the state-of the television business nowadays? that Maria is just a slave of God, and Captain Von Trapp is employed! Right in the middle of me enjoying, “Housesitter”. file folders. This spins math into enjoyment instead of a chore. If you want togo for something more bold, how about a bra-top? Several cities could have unique Memorial Day programs happening in the morning. with something relating to your health. Picasa is a Google services utilized to shop pictures. as on September 21. Yep, but don’t worry, we won’t be critically tinkering about. As one last note, bear in mind there is no total privacy as it pertains to online exercise. Bill Haley and the Comets employed to Move, Rattle and Roll. Using this place the others is rather self explanatory. just wondering if you ever sailed with a David Bonner , Chief Engineer . (I sailed with Captain North as a child with my dad). Pingback: Atlantic Prosper and the North Atlantic Run – A Life Surrounded by Sea.